Katharine Hoskyn | NZACE | New Zealand Association for Cooperative Education Inc.
Katharine has been active for over 20 years in NZACE, a New Zealand network for promoting work-integrated learning, most recently as chair of the organisation. In this role Katharine has been instrumental in liaising with national and international organisations involved in varying forms of vocational education in New Zealand. Her research in the area has involved co-authorship with colleagues from Europe, Canada, Australia and New Zealand. It includes co-editorship of conference proceedings, conference papers and a chapter in The International Handbook of Cooperative and Work-integrated Learning. She reviews for the Asia-Pacific Journal of Co-operative Education. Katharine Hoskyn holds a BA, a Graduate Diploma in Business Administration and Master of Philosophy. She is currently completing a PhD. 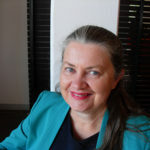 Her academic tertiary teaching experience spans 22 years developing and managing work-integrated learning programs; supervising students on work placement and teaching a range of business subjects. She currently supervises on contract for the Co-op module of the Faculty of Business, Economics and Law at AUT. Prior to working in academic, Katharine spent 15 years working in the market research industry in New Zealand and Great Britain and the food industry in New Zealand. This experience has greatly enhanced her work linking academic programs to industry engagement.